The exclusive blend of glossy and smooth matte finish with a streak of gold embellished in the middle makes Spice V801 a perfect eye catcher. Packed in an 8.3 mm sleek design, the Spice V801 provides a unique double dose of social experience wherein the users can access two different social media accounts, including Whatsapp, Instagram, Facebook and Twitter, at the same time. The Spice V801 is backed by a powerful 3GB RAM & 16GB internal memory expandable upto 32GB offering a rich and hassle free multi-tasking experience to the user. 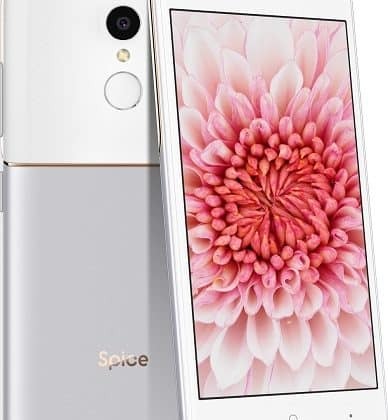 The Spice V801 further comes equipped with fingerprint sensor technology that provides the user with secure, smooth, accessible and effortless functionality while navigating through the device. Multiple features such as, call via click on fingerprint, instant access to favorite apps with customization upto 5 fingerprints as personal shortcuts and access to private profiles and files, thereby adding more value to the overall experience of the smartphone. Powered by 1.25Ghz Quad-Core Mediatek processor and Mali T720 GPU and Android 7.0 operating system, the Spice V801 offers a swift, sassy and fluidic experience to its users with multitasking between applications. The 2700 mAh Li-Polymer Battery powerful battery provides uninterrupted usage and standby of upto 270 hours. SIM+SIM+T-Flash Tray Design gives users the luxury of using Dual SIM along with expandable Memory slot which can be expanded to 32GB. Equipped with 8-megapixel auto focus rear and front camera with flash, the Spice V801 enables the user to effortlessly take beautiful panoramic, wide angle view images. Additionally, with advanced image processing 8MP camera, an f/2.0 aperture, the Spice V801 provides great selfie moments to the users with premium features like Beauty Mode, Facemask etc. Gifting ideas for Diwali | Spice Devices 0 out of 5 based on 0 ratings. 0 user reviews.